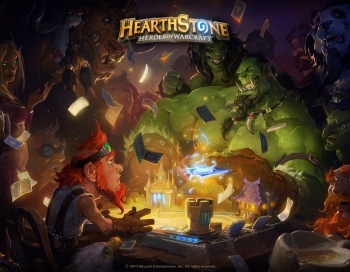 A new report shows digital card games are big enough for their own business category, with Blizzard's Hearthstone leading the pack. We already know that Hearthstone is a fun game, but how successful is it overall? One way to measure its impact is financial earnings, and on that score Hearthstone is doing very well. In a new market report released by Superdata, it appears that Blizzard Entertainment is raking in a cool $20 million every month - not bad for a completely free-to-play game. Not only that, the entire genre of digital card games is quickly becoming a dominant business category alongside MOBAs and other comparable gaming genres. "Collectible card games have been tremendously popular for a long time, and in its transition to digital has managed to reach a massive audience," Superdata analyst Carter Rogers explained. "It's a fascinating category ... because it combines micro-transactions with strategic, competitive game play. Collectible card games have remained popular through the years and will continue to be a source of inspiration for the industry at large." According to Rogers, Superdata has been following CCGs since 2009. The latest study surveyed 776 players from May to June 2015, while analyzing 256 million transactions from 2011 to 2015. The results show that CCGs were a $1.2 billion industry last year - which is predicted to increase by $100 million by year end. There are lots of great games within this growing market, but Hearthstone clearly leads the pack. Rogers attributes this success to Activision's marketing and cross-promotion platforms. Combined, that's created 8 million PC players and 9 million on mobile devices - although there's certainly overlap between each group. "Being able to build on a vast, pre-existing narrative economy allows both existing and new players to quickly find a touchpoint with the game, thereby establishing a different relationship compared to the majority of free-to-play titles currently available on iOS and PC." Naturally, Superdata's study has other interesting tidbits as well. For example, roughly 80% of CCG players are male - making it one of gaming's most male-dominated markets - while the average age is 31. Regardless, I suspect the big focus is on how the market will continue to grow, especially with a new Hearthstone expansion on the way.